1 In vs. 4 – 9 we see that Eliashib the priest had actually emptied a chamber in the temple of God, and had prepared it for Tobiah to stay in. Tobiah had been the one who had opposed Nehemiah and the people of God as they rebuilded the city of Jerusalem. He had to go. Nehemiah gave him the boot. 2 In vs. 10 – 13 we learn that the Levites had to go back to the fields to work because the people of God were not supporting them through their tithes and offerings. Nehemiah corrected this problem as well. 3 In vs. 15 – 22 we see that God’s people were violating the Sabbath by working, and by trading with outsiders. 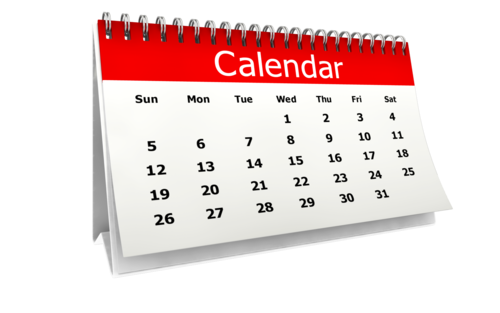 God wanted the Sabbath Day to be kept holy, and set apart from the normal routines of the week. Nehemiah commanded that the gates of the city be closed on the Sabath so that the merchants could not enter in to do their business. 4 Finally we see that the Jews began to inter-marry with the heathen people around them. It got to be so bad that some of the children did not even speak the Hebrew language, but instead conversed in the language of the land where the mother came from. Nehemiah had a fit about this, and made the people promise to separate from people who were not Jews. He reminded them of how even King Solomon was caused to sin because of his marriages to non-Jewish women. God wants his people to marry within the household of faith. It is amazing how quickly all of these abuses crept back into the lives of the people of God. Every once in a while we need to have an old-fashioned house cleaning to remove all of the junk that creeps into our lives as well. Why not take a spiritual inventory of your own life. 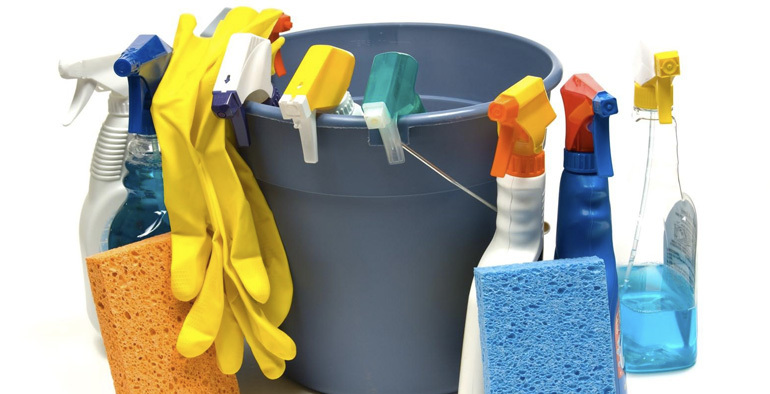 Is there anything in your home, or in your life that God would want cleaned out? Just a thought. Posted in Thoughts from Nehemiah by Phil Erickson with no comments yet. I enjoyed thoroughly reading these three chapters today from the Book of Nehemiah. The people of Israel are back in their own land after having been in captivity for many years. They are united, “in one accord”; and they are fully surrendered to the Lord. This is certainly one of the high places in their history. In these three chapters I have noticed some ingredients that were in place that brought about a wonderful revival in the lives of God’s people. As I already mentioned, the people were unified, which in itself is an important part of the revival; but in addition to that, let me list some ingredients that I observed. 1 They are putting a heavy emphasis on the reading and preaching of the Word of God. We see this in chapter 8, and again in chapter 9. The people stood for a fourth part of the day listening to the Word. We have a tough time getting people to sit in padded seats for an hour. The word caused them to implement many changes in their lives, including the observance of the Feast of Tabernacles. 3 In chapter 10, we see that the people have made a commitment to the House of God. They committed to give their offerings so that the servants of the Temple, including all of the priests and Levites, would have everything that they need in order to minister to the people. I have left out some other things, but as you can see from the reading today, these three ingredients were part of one of the greatest revivals in the history of God’s people. If we ever see revival again in America, I bet that these three ingredients will be here as well. In our passage today we see Nehemiah busy doing what the Lord had called him to do: rebuilding the wall of the city of Jerusalem. He had a job to do, and he was intent on completing it. Now there were also people in the area that were intent on stopping Nehemiah from fulfilling the will of God, but Nehemiah did not let them distract him from completing his work. I love what Nehemiah said: “I am doing a great work, so that I cannot come down: why should the work cease, whilst I leave it, and come down to you?” The work Nehemiah was doing was certainly great, because it was God that had asked him to do it. I have a great work to do for the Lord as well, and so do you. God has something to do for all of us who are His children. We must not get distracted from completing the work that God has given us. I have observed through the years that distractions can come from a variety of sources. The wicked one is famous for distracting people away from the will of God. This was the case with Sanballat, Tobiah, and Geshom from our text. They were wicked men who did not have Nehemiah’s best interests in mind. They were working against the will of God, but notice how they tried to disguise themselves as God’s servants and as Nehemiah’s friends. As God’s children we need to learn to be discerning about the true motivations of the people around us as they attempt to pull us away from the primary tasks that God has given us. Another type of distraction comes from good people who often invite us to do “good things”; but even these good things become evil if they take us away from the best things. I am slowly learning how to graciously turn down many “good” invitations from caring people. I simply do not have enough time and energy to do all of the things that I might like to do, especially as they pull me away from the primary areas of my responsibility. As a pastor, I get invited to many birthday’s, picnics, graduations, dinners, weddings, conferences, barbecues, etc. I love to be with God’s people, but I simply cannot go to them all. A third distraction is the distraction God brings your way. There are times that God will interrupt the daily routine in life in order for you to learn something, or maybe in order for you to accomplish something special for Him. Again, we must be very careful to discern whether these distractions are indeed from God. A few years ago, because of the tight budget at the church I had to go back to a secular job for a few months, which required me to work overnight 6 nights per week. 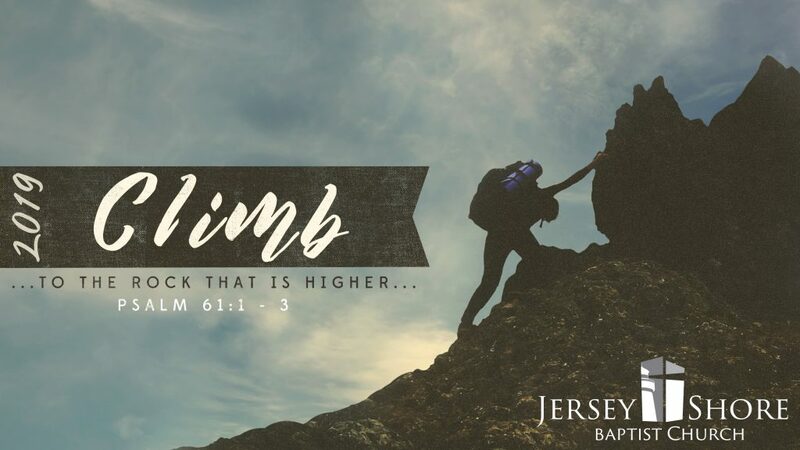 This job was certainly a hindrance that kept me from doing all that I might have wanted to do in the ministry; but I am convinced that God had lead me down that path, at least temporarily. My primary ministry is my family, and God had provided this job as a means for my family to be taken care of while still allowing me to serve as the pastor. However, because of this constraint on my time, I was very limited to what I could do. My life consisted basically of working, sleeping, prayer, Bible reading, studying and preparing for messages, and a little soul winning. That is all that I could do during those months. I had to learn to say no to many other things so that I could do those main things. My focus was still on serving God, but I had to take some time away from that service in order to help the church financially, and in order to put food on my family’s table. God taught me much in the short time that I had been working the outside job, and He even used me to be a light to a very dark workplace. I thank the Lord that my time at the supermarket was short, and that He has turned our church’s financial situation around, but I am convinced that God allowed that period in my life for a reason. The bottom line of today’s devotion is this: don’t allow distractions to pull you away from the primary things that God wants you to do, unless, of course, it is God who is doing the distracting. Posted in Thoughts from Nehemiah by Phil Erickson with 1 comment. My previous posts from this passage have always focused on Nehemiah as he led the people of God to rebuild the walls of Jerusalem, but this morning I would like to consider the people themselves, as they sacrificed and labored for the Lord. Our text verse says that the people had “a mind to work”, which means that they were willing to put all of the necessary effort and skill into the reconstruction of the walls around the city of Jerusalem. Nehemiah was merely one man, and there is no way that he could accomplish a task of this magnitude without the help of many men, women, and children that all did their part to get the job done. In my ministry, there have been a number of times when the people of God were so inspired by a need that they all got on board to help meet it. Those were certainly sweet times. 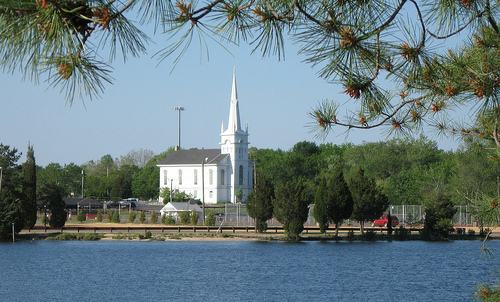 It is wonderful to see the people of the church all get together to accomplish something for the Lord. However, most of the time, the work of the ministry is done by a few people who have to do more than their share of the labor. You may have heard it said that twenty percent of the people do eighty percent of the work. I have found that to be true more often than not. It is a shame that we can’t get more of the people of God involved in the work of the ministry. Imagine with me what it would be like if we had every member of the church out for soul winning; and how about if we had more people than we could use to do all of the maintenance on the building and grounds. Wouldn’t that be wonderful? Think about what could be done if we had people waiting for the opportunity to teach a Sunday School class, work a bus route, or disciple a new convert. I believe that there would be several benefits to this, but two stand out. First, the people that are sacrificing and participating would get so much more out of the Christian life. The happiest people are the ones who get involved in serving others. Secondly, I believe that we could do so much more for the cause of Christ. More people would be saved, and more lives would be changed for the glory of God. I want to challenge every saint of the Lord that is reading this article today. Have a mind to work. Find something to do in your local church, and give it all you’ve got. Get busy! Posted in Devotions, Thoughts from Nehemiah by Phil Erickson with no comments yet. I love reading these stories about people who build something great for the Lord. Nehemiah heard that his home city, Jerusalem, was in a mess and he decided to do something about it. I see in this passage a pattern that can be followed by God’s people today as we desire to be used of Him to fulfill His will for our lives. 2 Nehemiah prayed – He had a burden for Jerusalem and the people of God. He wept, he fasted, and he prayed for the condition of Jerusalem. When he prayed, he reminded God of the promises that God had made about His mercy on the people if they would turn back to God. 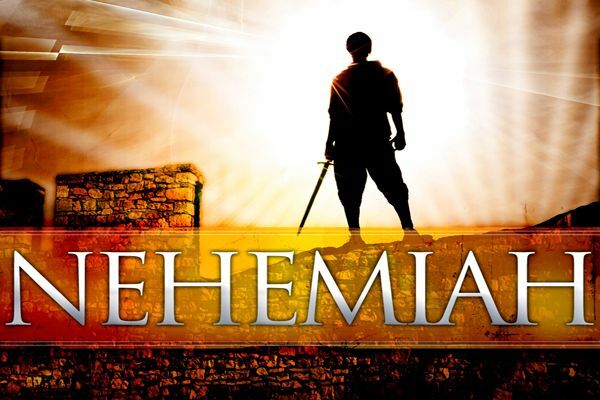 3 Nehemiah performed – he took the lead. The difference between Nehemiah and most of us is that he was willing to prepare and act upon the burden that he had. So many of us have a burden to do something; but we never get to the point where we take action. In the local church, we see many people who know what needs to be done; but never actually do it. Don’t just talk about (or worse complain about it); do something about it. 4 Nehemiah persisted – He did not quit. So many of us today allow the slightest things to knock us off course. Nehemiah did not quit because of the difficulty of the task; or from the opposition that he faced (which will always be there). When I read these passages, I get excited about doing something for the Lord. I want to be able to say at the end of my life (and at the end of my day) that I accomplished something for the Lord. Posted in Thoughts from Nehemiah by Phil Erickson with 2 comments. 1 In vv 4 – 9 we see that Eliashib the priest had actually emptied a chamber in the temple of God, and had prepared it for Tobiah to stay in. Tobiah had been the one who had opposed Nehemiah and the people of God as they rebuilded the city of Jerusalem. He had to go. Nehemiah gave him the boot. 2 In vv 10 – 13 we learn that the Levites had to go back to the fields to work because the people of God were not supporting them through their tithes and offerings. Nehemiah corrected this problem as well. 3 In vv 15 – 22 we see that God’s people were violating the Sabbath by working, and by trading with outsiders. God wanted the Sabbath Day to be kept holy, and set apart from the normal routines of the week. Nehemiah commanded that the gates of the city be closed on the Sabath so that the merchants could not enter in to do their business. 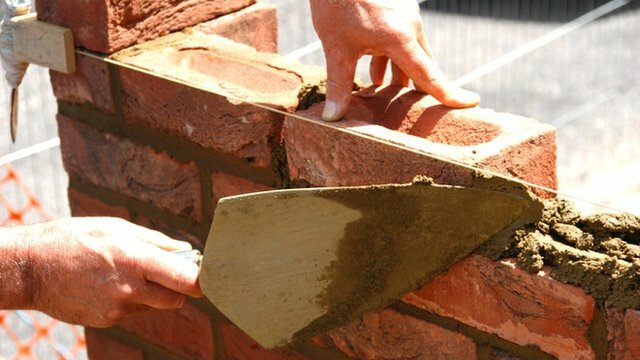 In our passage today we see Nehemiah busy doing what the Lord had called him to do: rebuilding the wall of the city of Jerusalem. He had a job to do, and he was intent on completing it. Now there were also people in the area that were intent on stopping Nehemiah from fulfilling the will of God; but Nehemiah did not let them distract him from completing his work. I love what Nehemiah said: “I am doing a great work, so that I cannot come down: why should the work cease, whilst I leave it, and come down to you?” The work Nehemiah was doing was certainly great, because it was God that had asked him to do it. I have a great work to do for the Lord as well; and so do you. God has something for all of us who are His children to do. We must not get distracted from completing the work that God has given us. I have observed through the years that distractions can come from a variety of sources. The wicked one is famous for distracting people away from the will of God. This was the case with Sanballat, Tobiah, and Geshom from our text. They were wicked men who did not have Nehemiah’s best interests in mind. They were working against the will of God, but notice how they tried to disguise themselves as God’s servants, and as Nehemiah’s friends. As God’s children, we need to learn to be discerning about the true motivations of the people around us as they attempt to pull us away from the primary tasks that God has given us. A third distraction is the distraction God brings your way. There are times that God will interrupt the daily routine in life in order for you to learn something; or maybe in order for you to accomplish something special for Him. Again, we must be very careful that to discern wheter these distractions are indeed from God. Last year, because of the tight budget at the church I had to go back to a secular job for a few months, which required me to work overnight 6 nights per week. This job was certainly a hindrance that kept me from doing all that I might have wanted to do in the ministry; but I am convinced that God had lead me down that path, at least temporarily. My primary ministry is my family, and God had provided this job as a means for my family to be taken care of while still allowing me to serve as the pastor. However, because of this constraint on my time, I was very limited to what I could do. My life consisted basically of working, sleeping, prayer, Bible reading, studying and preparing for messages, and a little soul winning. That is all that I could do during those months. I had to learn to say no to many other things so that I could do those main things. My focus was still on serving God, but I had to take some time away from that service in order to help the church financially, and in order to put food on my family’s table. God taught me much in the short time that I had been working the outside job, and He even used me to be a light to a very dark workplace. I thank the Lord that my time at the supermarket was short, and that He has turned our church’s financial situation around, but I am convinced that God allowed that period in my life for a reason. The bottom line of today’s devotion is thus: don’t allow distractions to pull you away from the primary things that God wants you to do, unless, of course, it is God who is doing the distracting. 4 Finally we see that the Jews began to inter-marry with the heathen people around them. It got to be so bad that some of the children did not even speak the Hebrew language, but instead conversed in the language of the land where the mother came from. Nehemiah had a fit about this, and made the people promise to separate from peope who were not Jews. He reminded them of how even King Solomon was caused to sin because of his marriages to non-Jewish women. God wants his people to marry within the household of faith. It is amazing how quickly all of these abuses crept back into the lives of the people of God. Every once in a while we need to have an old-fashioned house cleaning to remove all of the junk that creeps into our lives as well. A third distraction is the distraction God brings your way. There are times that God will interrupt the daily routine in life in order for you to learn something; or maybe in order for you to accomplish something special for Him. Again, we must be very careful that these distractions are indeed from God. Recently, because of the tight budget at the church I have had to go back to a secular job, which requires me to work overnight 6 nights per week. This new job is certainly a hindrance that keeps me from doing all that I might like to do in the ministry; but I am convinced that God has lead me down this path, at least temporarily. My primary ministry is my family, and God has provided this job as a means for my family to be taken care of while still allowing me to serve as the pastor. However, because of this new constraint on my time, I am very limited to what I can do. My life consists basically of working, sleeping, prayer, Bible reading, studying and preparing for messages, and a little soul winning. That is all that I can do right now. I have had to learn to say no to many other things so that I can do these main things. My focus is still on serving God, but I have had to take some time away from that service in order to help the church financially, and in order to put food on my family’s table. God has taught me much in the short time that I have been working, and He has used me to be a light to a very dark workplace. I am not sure how long that God will have me do this, but I know that when it is over I will be a better servant of God because of the experience. 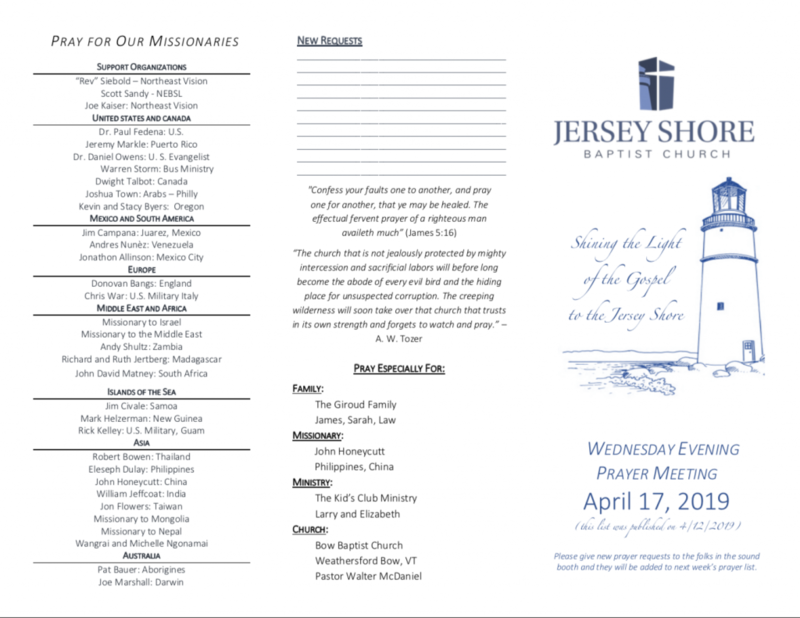 So to those of you who are part of the ministry here at Jersey Shore, and even to my extended family members, I must apologize for my absence at many of the “extra” events that I would normally have been a part of. Forgive me, it’s not that I do not want to be there, but I am very busy trying to do the main things. 1 Nehemiah prayed – He had a burden for Jerusalem and the people of God. He wept; he fasted; and he prayed for the condition of Jerusalem. When he prayed, he reminded God of the promises that God had made about His mercy on the people if they would turn back to God. 2 Nehemiah performed – he took action. 3 Nehemiah persisted – He did not quit.